The Dimplex Synergy 50 is a sleek, modern fireplace perfectly suited for wall mounting – including under any flat-screen TV. The large 50 inch width, black finish, incredibly realistic flame technology and beautiful glass ember bed set this bold unit apart. 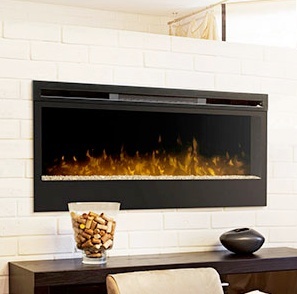 Enjoy the ambiance of a gas flame with or without heat, for year-round comfort and enjoyment. With no flame heat or emission – and a glass front that remains cool to the touch – the Synergy 50 built-in fireplace insert is also a safe choice for any modern home, any time of the year. The Synergy 50 offers comfort, ambiance and style and is sure to be the most talked about piece in any room. LED Flame Technology realistically creates the illusion of a true fire. Costs less than 1 cent per hour to operate (flame only) or 7 cents per hour heating. Three installation options: wall-mount, fully-recessed into new construction or retrofit into existing 2×4 wall.